Data Robotics (Data-driven machine learning Robots), defined as the set of technologies, techniques and applications required to design and implement a new automation process based on self-learning and artificial intelligence technologies, with the aim of increasing the productivity and efficiency of business processes, referring to the consolidation of robotics and Machine Learning techniques, facilitates the introduction and integration of automation into organisational processes. Certain operations, immediate in nature for the operator concerned, can be carried out efficiently by a robot with the support of Machine Learning techniques. This synthesis has clear application for many business processes across all industries. 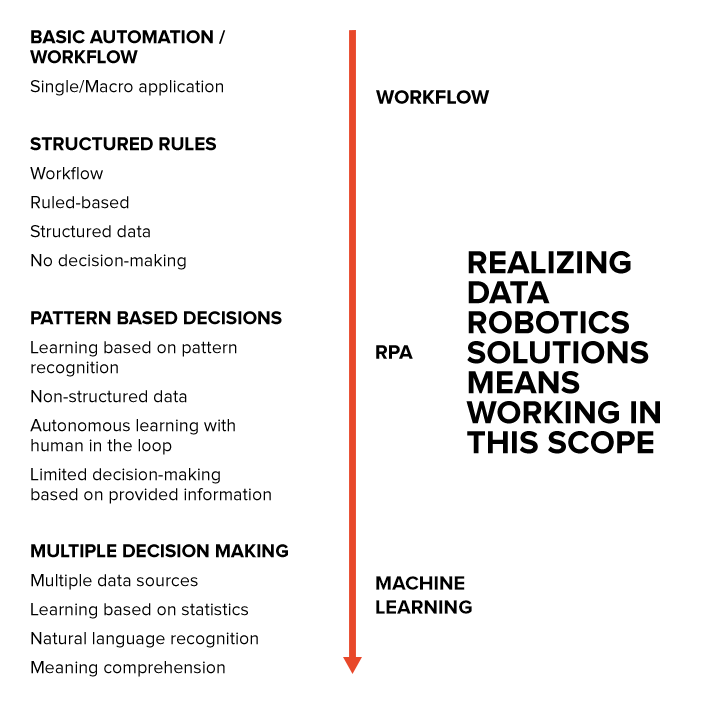 In particular, the Data Robotics framework includes both Robotic Process Automation (RPA), as well as Intelligent Process Automation (IPA) tools. Thanks to the application of “smart” technologies IPA guarantees an improvement of RPA, facilitating the evolution from solutions that handle straightforward and recurring tasks, to new paradigms based on machine learning techniques. This allows Data Robots to develop new knowledge, to make decisions, to make assessments and to provide feedback: “it takes the robot out of the human”. Reply supports its customers from the very beginning of the automation path through the application of the “Automation Opportunity Matrix”, a structured method, developed in collaboration with DEVO Lab by SDA Bocconi, which allows the mapping, based on qualitative and quantitative features, of internal processes in four dimensions of analysis: the structure of business processes; the importance of the process for carrying out the company's business; the economic value of the process and the exposure of the company to risks if the process fails to meet certain operating and / or regulatory standards. The Data Robotics Lab is an innovation laboratory developed by Reply in collaboration with the Bocconi DEVO Lab, a research centre within the SDA Bocconi School of Management focussed on the themes of digital transformation. The laboratory is a centre of expertise that combines the perspective and scientific methods of the Business School with Reply’s technological expertise. The AI Landscape Monitor comprises a methodology and a set of tools to scout the AI ecosystem by carefully analyzing its vendors and the solutions they offer. Find out what's the best tech solution for your company! The Data Robot "observes" for a certain period of time the input data and the decision taken by the human user. The 70% of input data and respective decisions caters the Data Robot: the algorithm that best fits the decisions taken by the human is chosen. The remaining 30% of input data are used by the chosen algorithm to take the decisions; if the decisions match the ones taken by the human the algorithm is confirmed, else the input data are coupled with the correct decisions and used to refine the Data Robot algorithm. Once the initial training is completed, the new input data are processed by the Data Robot algorithm that take the decision autonomously and assign a "level of confidence": if too low, the Data Robot asks the human to confirm / modify the decision. In case the Data Robot decision is discarded, it will be used to refine the algorithm as described in the "Test accuracy" step. The more data you have the better decision you can take on a micro and macro level. The more processes are traced the more you can get opportunity to identify optimization gaps and increase efficiency. To automate means to fully track and document the system automated. Data Robotics solution provides in depth telemetry about workflow, enabling deep insight to comply with specific regulations. Data Robotics solution never needs time off (24/7). The same volume of work can be done in less time. While Data Robotics handle the more repetitive jobs, employees can participate in more value-added activities (personal interaction, problem solving, decision making). When employees feel their work is valued and worthwhile, their productivity increases. In addition employees are better supported for their value-added tasks, increasing productivity again. Employees are human and all humans make mistakes. Data Robotics eliminates processing errors if all processes and sub-processes are well mapped. There will still be need for testing, training and governance of the Data Robot. Complication with offshore labor are minimized or eliminated (time zone differences, cultural and language barriers, …). Decrease the need for employee recruitment and training costs. Remote management of IT infrastructure to investigate and solve problems for faster process throughput. Data Robotics makes it easy to maintain a scalable infrastructure, allowing to handle short-term demand without extra-recruiting or training. Reply has developed a number of accelerators aimed at applying Data Robotics to different use cases. Accelerator for end-to-end management of the invoicing process, from data entry automation for information contained in invoices, to the automated verification and reconciliation, using OCR and Machine Learning algorithms, of the invoices and the relative delivery notes, with automated identification of the reasons for any discrepancies (i.e. prices and/or quantities different from those agreed upon, etc. ), based on product codes in the materials database and any other relevant data. Dashboards through which the user can define the best “asset mix” and OEE indicator (Overall Equipment Effectiveness) for each individual production line process. The solution makes it possible to simulate various configurations used in automated production lines in order to recommend the optimal mix of devices required to achieve the overall performance requested by the end customer. Now more than ever, the intervention of financial institutions in the consolidation of the comprehensive credit risk management is fundamental due to the delicate balance that characterized them. The solution is developed on Microsoft Azure Machine Learning, the service that allows building and testing powerful cloud-based predictive analytics. ML Studio allows the control of the end-to-end process: application of data pre-processing modules to raw data, running of the experiments on the prepared data using a machine-learning algorithm and test the resulting model. Accelerator for the automated creation of employee expense reports through the capture of receipts using smartphone cameras which are sent to a dedicated inbox in order to categorise the expenditures, to carry out reconciliation controls on the expense report submitted and to handle the fully automated approval phase. Chatbot capable of retrieving all the necessary information from multiple business systems, obtaining real-time updates on the status of orders received from a customer in order to analyse key KPIs or to request customer information; the bot can also be activated by implementing components focused on the availability of goods in stock, promised delivery dates, delivery status and claims management. Match-up is an advanced tool for the analysis, reconciliation and matching of complex data (single and/or multiple). Match-up is the value added solution in terms of: ease of use; independence from platforms; flexibility of the usage model (cloud-based or residing on the company’s servers); information enrichment to support reconciliations; alternative actions or proposals (reconciliation proposals or recommendations reports); taxonomy of rules (simple, medium and complex) and data robotics. The Claim Prediction Tool (ClaP) is a system for the analysis and supervision of customers at risk of churning. The use of this tool finds application and generates value within the general framework of CRM and Customer Retention activities, with particular reference to Proactive Caring, to actively monitor and prevent reports of customer dissatisfaction and Trouble Ticket Management, to effectively solve high-priority issues, assigned based on customer profiling.